In NDT the key question is the reliability of the methods, verified by validation. Regarding the visual methods, the reliability, that means probability of the visual recognition depends on the optical abilities of the scene with the objects. These abilities were determined quantitatively with an image-processing system for fluorescent magnetic particle inspection. This system was used, determining quality of detection media, following the type testing of the european standard prEN 9934-2. Another application was the determination of the visibility in dependance of the inspection parameters as magnetization, application of the detection medium, inclination of the test surface, surface conditions and viewing conditions. For standardized testing procedures and realistic parameter variations the probability of detection may be determined on the basis of physiological lightening in dependance of the defect dimensions. Quantitative determined visual recognition for usual inspections, indicate that for indications with lengths over about 1.5 mm the probability of recognition is about 100 %. This is also applied to the penetrant inspection. This does not include the so called "human factor" which means that it cannot be guaranted that the inspector detects all indications for instance not always observing the inspection surface with full concentration. Today, the reliability of NDT-methods and its validation is the most interesting question [1, 2]. In the case of visual methods, the reliability depends on the visual recognition "visibility". 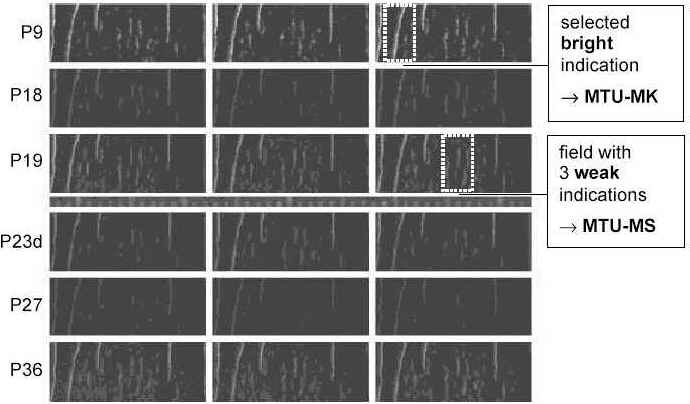 The quantitative determination of the visiblity of indications by visual comparison is relatively difficult. But with an image-processing system the optical and physical parameters (luminance, dimension) of the indications can be determined. From this results, the visual recognition can be evaluated on the basis of physiological lightening . The method was applied for determination of the quality of the detection media on test pieces following the type testing of the European standard  in order to check the validity of the method. The other application was the determination of the visibility in dependance of the variations of the inspection parameters (application of the detection medium, magnetization, inclination, viewing conditions) in a range which may appear in the practical inspections. The results leads to conclusions on the visibility level which is a measure of the probability of recognition for the indication that means of the reliability of the method. Contrast C is the contrast of the luminances between the object Lo and its surroundings Ls. C = (Lo - Ls)/Ls. With increasing contrast, visibility increases. Adaptation luminance Lad, is the luminance to which the eye adapts its sensitivity. It corresponds to the luminance of the field of vision. With increasing adaptation luminance, visibility increases. Object dimension is defined as the viewing angle in radiant minutes under which the eye observes the object. With increasing dimension, the visibility increases. The quantitative description of visibility is based on the contrast threshhold dC which is the smallest contrast necessary to recognize an object. The contrast threshold depends on the viewing conditions and the optical abilities of the object. Quantitative correlations are based on experimental investigations which are recommended by the "Commission International d´Eclairage" CIE . The results are presented as dependant on the adaptation luminance and the object dimension as parameter . The object dimension is described by the viewing angle (in angle minutes ') of a circle disc. As usual , the presentation time was set on 0.2 s. and the detection probability on 50 %. These quantitative correlations describe the fact, that visibility increases with increasing adaptation luminance if the contrast remains constant. The contrast threshold was determined by test persons under optimal conditions which included viewing and environmental conditions as well as the visual acuity . In any real visual inspection (e.g. detection of small objects) the contrast between the object and the surroundings should be much higher than the contrast threshold. This factor is defined as Visibility Level VL = C/dC. The factor is a quantitative measure for the visibility of objects. Recommended values are dependant on the inspection task and are in the range VL = 3 - 60. The visibility level VL of special viewing tasks may be estimated from the the correlations of the quantitative visual recognition. For an adaptation luminance of 10 cd/m2 and given contrasts (C = 0.5; 1.0; 2.0), VL is described in Fig. 1 in dependance on the object dimension in angular minutes. An object dimension of 1' represents a circle with a diameter of 0.12 mm in a distance of 0.4 m.
For applications on indications it is assumed that the visibility level VL of rectangular objects (indications) is the same as for circles with the same area. The length l and width w of indications are correlated in very different manners, mainly dependant on the geometrie of the inhomogenity (crack). From some observations, the following correlation between w and l was introduced: w (mm) = 0.05 + 0.03 l (e.g. l =1.5 mm; w 0.1 mm). For the same areas, the length l of the indication can be introduced in Fig. 1 as a second scale. The arrangement consists of a usual video camera and a video-capturing system ("frame grabber") which adopts the video signal to the PC. The image-processing program (under WINDOWS 95) allows a flexible valuation of the scene that means the determination of the visibility level or a proportional value. The key of the program is a contour-following algorithm which surrounds all objects (indications) over a predetermined luminance level. The luminances (grey values) of the surrounded object are summed up which presents the light stream of the indication. For the valuation of the indication, the corresponding light stream of the surroundings may be substracted (i.e. the difference of the luminances Lo - Ls). In principle, the pictures with the indications to be valuated where stored. The regions of interest where cut out and rearranged in a new picture for further processing as shown for example in Fig. 3. You see a part of the reference block No. 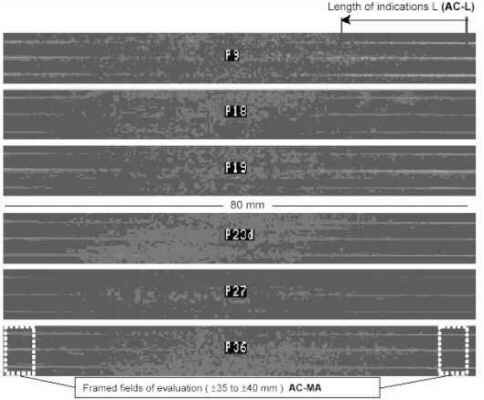 1 with indications from 3 wetting procedures (horizontal) of 6 detection media (vertical). Following the draft european standard  for type testing, quality of the detection media shall be verified on 2 reference blocks as shown in Fig. 2. On the reference block No. 1, created by Mr. Dickhaut , (Nr. 3 of the MTU) the indications shall be valuated by comparison with the indications of a detection medium with known quality. On reference block No. 2 (AFNOR-C; A-C) the lenght of the indications shall be determined as a measure for the quality. In order to check the the validity of this method , 6 detection media Px where selected and applied on the reference pieces following the instructions of the standard (inclination angle 45° ; 3 applications of the detection medium and averaging). The arrangements of the cuts can be seen at Fig. 3. Indications or parts of indications are chosen for the valuation and marked by dashed lines. The results are given in Fig. 4. The detection medium P23d was choosen as reference (100%). It becomes evident, that the detection media will not be differentiated so much by valuation of the lenght on the AFNOR-C (AC-L). For instance P27 which is valuated on the MTU as "not sufficiant" reaches 71% of the value of the best powder. Moreover, this valuation gave another range of the detection media than all 3 valuations of the luminance (AC-MA, MTU-MK, MTU-MS) which gave the same range. The best differentiation will be realized with the small indications on the MTU (MTU-MS) which confirms with other results . It can be concluded, that the length measurement on the AFNOR-C (AC-L) is difficult and gives a different and incorrect valuation of the detection medium which should be taken into account. The experimental investigations are carried out in order to get an idea about the variations of the visibility of the indications during practical inspections. The specimen where a test piece with sparc eroded artificial defects (Width 25 µm; depth d = 30, 60, 120 µm) and other specimen with natural cracks, a forged steering lever and a weld. As an example, in Fig. 4 the steering lever with 2 cracks can be seen and below the dependance on the visibilty of a weak indication and a part of the bright indications on the field strenght H.
The nominal visibility level VLnom was determined from the viewing conditions of indications as decribed in 2.2 (Fig. 1). Assuming that this VLnom is equivalent to the VL with nominal inspection parameters, for the worst case of any inspection parameter the relative reduction R of the visibility of the indications was determined and summarized to the overall visibility level VLmin. Naturally the following data may be varied and/or completed. Application A: The medium was applied 3 times and the results averaged. Inclination I: The nominal inclination of the surface against the horizontal was 15°. same quality controlled detection medium. In the wide field of applications, a visibility level VL = 3 - 60 is recommended. For our recognition task, we are obliged to take into account that our random conditions are far from the experimental conditions of the basic researches (Young test person with a high visus under ideal environmental conditions) . Furthermore in our case we have a more difficult visual searching task. Parameter variations as the increase of presentation time from 0.2 to 1.0 s. and the detection propability from 50% to 100% are taken into account . In spite of the gliding variations of the parameters as well as the visibility level, for simplification let us assume VL = 10 as minimum requirement. It can be concluded, that indications with lengths of more than about 1.5 mm can be detected with high probability (100%) . This confirms with the recommended smallest acceptance level (optimum conditions) of 1.5 mm (registration level) in various product standards (e.g. as ). It is self evident that smaller indications (l = 0.6 mm) will be detected too, but the correlations explained above, clearely indicates a decreasing probability of detection with decreasing length of indications. Naturally, such a high probability of detection of theoretically 100% never can be realized in practice. The inspector will not recognize all good visible indications at any time because he cannot always be fully concentrated on his task, which is called "human factor". This human factor appears in any visual inspection and may be reduced only by a second redundant inspection or extreme signals as a light flash or an acustic signal. With the objective determination of the visibilitity of magnetic particle indications quantitative researches on the influence of the inspection parameters will be possible. The first part deals with the type testing of detection media which is as well on the course of adoption for type testing of liquid penetrant systems (prEN 751-2). The key question of today in NDT concerns the reliability of the methods verified by validation. Applying the established theory of physiological lightening on MT (PT as well), with increasing length of indication under optimum conditions the probability of detection goes towards 100% in the region of 1.5 mm which confirms with other results . Practically this is not possible because of interferring influences on the operator which is typical for all visual methods called the "human factor". 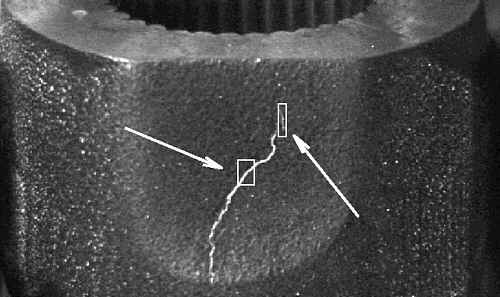 When comparing the magnetic particle- and penetrant inspection with other visual methods it appears that our viewing conditions are not so bad, compared with other methods. In radiographie the contrast on the film is much lower. In ultrasonics and eddy current the presentation times on the screen is shorter and the contrast is lower.